Rediff.com » Movies » Irrfan Khan to play Nehru? Irrfan Khan to play Nehru? 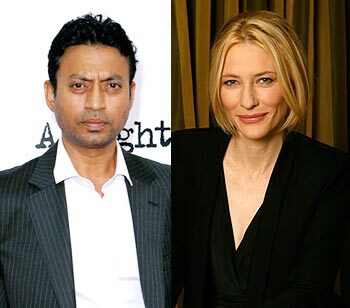 Filmfare Award winner Irrfan Khan is expected to play India's first Prime Minister Jawaharlal Nehru in Cate Blanchett starrer Indian Summer, according to reports. Indian government officials, being concerned about how the affair between Nehru and Lady Edwina Mountbatten, wife of last British viceroy of India, would be played out, scrutinized the script, and have reportedly conditionally shown green light for its shooting to go ahead. Government officials reportedly want some incidents removed, like Nehru-Edwina kiss, their being in the bed together, etc. The makers reportedly have also been told to state that the film is a fictional work and any changes in the script should seek pre-approval. Officials reportedly will oversee the shooting and it has to be okayed before release. Blanchett (Elizabeth) will reportedly play Edwina in this upcoming movie, which will portray last days of British rule in India. Golden Globe winner Hugh Grant (Four Weddings and a Funeral) will reportedly be last British Viceroy in India Lord Louis Mountbatten. Aimed at a release in 2011, this Universal Pictures and Working Title Films drama will be reportedly directed by BAFTA winner Joe Wright (Atonement) and written by Oscar nominated William Nicholson (Gladiator), and will show Mountbatten handing over the power during the summer of 1947 to Nehru. It is based on the book Indian Summer: The Secret History of the End of an Empire by Alex von Tunzelmann. Film will reportedly follow the important events during India's Independence. It will be shot in capital Delhi, Punjab, Jammu-Kashmir, and other parts of India and filming starts early next year. Cate Blanchett to be Lady Mountbatten? Mr Antony, what's your agenda for India's defence?